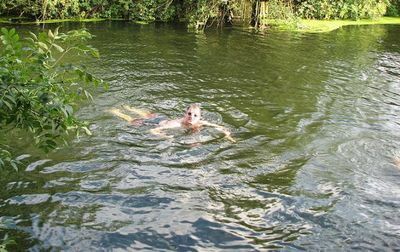 While we all enjoy relaxing by the beach on a hot summer’s day, swimming in a river, creek or natural waterhole is also a lot of fun. 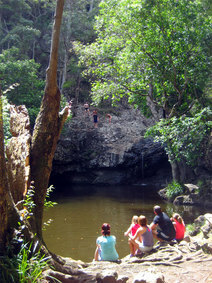 In your opinion, what are the best natural swimming holes near Brisbane? Are they close to the city and easily accessible? Is the water fresh and unpolluted? Are they safe for people of all ages? There are several that I can think of. Here are some worth hiking to. The lower portals at Mountain Barney is a fairly easy walk with a great swimming hole. Gwongoorool pool in the Binna Burra section of Lamington National Park is amazing. Cool to cold even in the height of summer. A popular spot is Cedar Creek Falls at Mt Tamborine..
Cash's Crossing at Albany Creek is easily accessible and has a large clean waterhole, which is perfect for cooling off during a hot summer afternoon. The best swimming hole is one which is very close to Brisbane city. It is man-made and is situated at Southbank Parklands. It looks natural, has clean chlorinated water, easily accessible and it's free. For those who don't know Southbank Parklands, it is on the south bank of the Brisbane river directly across from Brisbane city. It is close to bus stops, train station and the City Cat ferry. If you prefer to drive your own vehicle, there are public car parks. Where else in the world can you obtain a clean sandy beach with life guards close to the CBD all for free? Where are the best spots around Brisbane for whale watching? What is Brisbane's best water park?